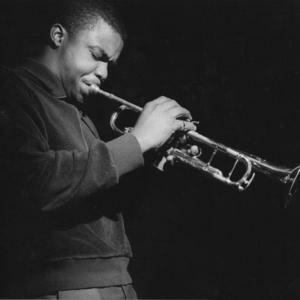 Freddie Hubbard (Frederick Dewayne Hubbard, Indianapolis, Indiana, April 7, 1938 - Sherman Oaks, California, December 29, 2008) was an American jazz trumpeter. Hubbard was born in Indianapolis, Indiana, and associated in his youth with various musicians in Indianapolis, including Wes Montgomery and Montgomery's brothers. Chet Baker was an early influence, although Hubbard soon aligned himself with the approach of Clifford Brown (and his forebears: Fats Navarro and Dizzy Gillespie). Hubbard was born in Indianapolis, Indiana, and associated in his youth with various musicians in Indianapolis, including Wes Montgomery and Montgomery's brothers. Chet Baker was an early influence, although Hubbard soon aligned himself with the approach of Clifford Brown (and his forebears: Fats Navarro and Dizzy Gillespie). Hubbard's jazz career began in earnest after moving to New York City in 1958. While there, he worked with Sonny Rollins, Slide Hampton, J. J. Johnson, Philly Joe Jones, Oliver Nelson, and Quincy Jones, among others. He gained attention while playing with the seminal hard bop ensemble Art Blakey & The Jazz Messengers, appearing on such albums as Mosaic, Buhaina's Delight, and Free For All. He left the Messengers in 1964 to lead his own groups and from that time maintained a high profile as a bandleader or featured as a special guest, but never merely a sideman. Along with two other trumpeters also born in 1938, Lee Morgan (d. 1971) and Booker Little (d. 1961), Hubbard exerted a strong force on the direction of 1960s jazz. He recorded extensively for Blue Note Records: eight albums as a bandleader, and twenty-eight as a sideman. Most of these recordings are regarded as classics. Hubbard appeared on a few early avant-garde landmarks (Ornette Coleman's Free Jazz, Eric Dolphy's Out to Lunch and John Coltrane's Ascension), but Hubbard never fully embraced free jazz, though it did influence his playing. After leaving Blue Note, Hubbard recorded for the Atlantic label and moved toward a more commercial style. His next label was CTI Records where he recorded his best-known works, Red Clay, First Light, and Sky Dive. By 1970, his fiery, melodic improvisation and phenomenal technique established him as perhaps the leading trumpeter of his day, but a series of commercially oriented smooth jazz albums spawned some negative criticism. After signing with Columbia Records, Hubbard's albums were almost exclusively in a commercial vein. However, in 1976, Hubbard toured and recorded with V.S.O.P., led by Herbie Hancock which presented unadulterated jazz in the style of the 1960s Miles Davis Quintet (with Hubbard taking the place of Davis). 1980s projects moved between straight-ahead and commercial styles, and Hubbard recorded for several different labels including Atlantic, Pablo, Fantasy, Elektra/Musician, and the revived Blue Note label. The slightly younger Woody Shaw was Hubbard's main jazz competitor during the 1970s and 1980s, and the two eventually recorded together on three occasions. Hubbard participated in the short-lived Griffith Park Collective, which also included Joe Henderson, Chick Corea, Stanley Clarke, and Lenny White. Following a long setback of health problems and a serious lip injury in 1992, Hubbard played and recorded occasionally, but not at the high level that he set for himself during his earlier career. On December 29, 2008, Hubbard's hometown newspaper, Hubbard died from complications from a heart attack suffered on November 26 of the same year.